Aloe ciliaris is not easily mistaken for anothe aloe specie, the hairs on the leaf sheaths and distintive rambling stems make identification quite easy. The specie name 'ciliaris' refers to the leaf sheaths that are hairy along the margins. Common Names: Rankaalwyn (ranking Aloe), Climbing Aloe. 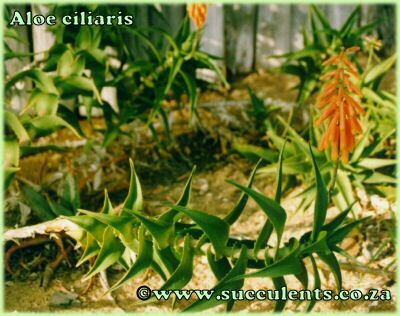 Distribution: Aloe ciliaris is found in the Eastern Cape of Southern Africa, they prefer woooded ravines and thicket vegetation. Stem: Numerous stems are formed that are slightly woody, in the wild the plant is normally supported by other plants, the stems in mature specimens can reach up to 6 meters in length and they are leafless except for the last meter or so. Leaves: Leaves occur on the terminal parts of the stems, they are dark green and spaced quite far apart form one another. Leaf margins are armed with hair-like teeth which are particularly long on the leaf sheaths. Inflorescence: Simple inflorescence that occasionally branches, racemes are short and do not bear many flowers. Flower: Flowers of Aloe ciliaris are relatively large, bright red in colour with the tips of the flower being yellow. Flowering Time: Flowering occurs throughtout the year. Watering: Will tolerate more water than the average aloe. Frost Protection: Frost preotection required. Aloe ciliaris grows well in cultivation especially if given space against a wall. Aloe ciliaris is not suited for container growth. A well draining medium is required to help prevent rot. Picture: Aloe ciliaris grown in cultivation, makes a great show when in flower.